I might have said goodbye to tomatoes in this recent post, but I snagged a few last fruits from my scraggly plants. 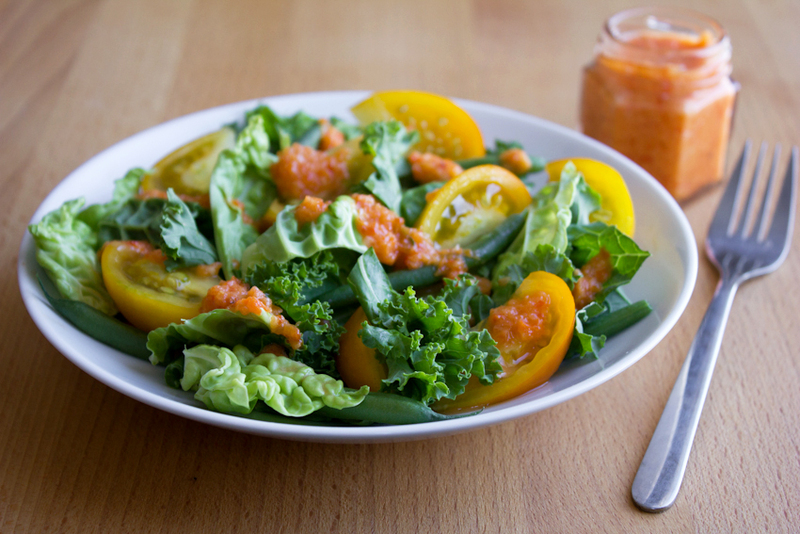 I was inspired by the textures of kale and fresh green cabbage at the farmers market, so I tore up a few leaves, tossed in some sliced tomatoes and fresh green beans, and whipped up the tastiest roasted red pepper dressing. This salad was a pleasant summer’s end surprise. It’s the end of tomato season in New England. I type this while picturing the tomato plants still standing in my garden: The stalks are brown and puckered; the few remaining fruits are speckled and dry looking; they need to be ripped out of their beds. So I nearly pounced on a $2 bag of tiny, multi-colored cherry tomatoes this weekend at the farmers market. They may be the last of the year! 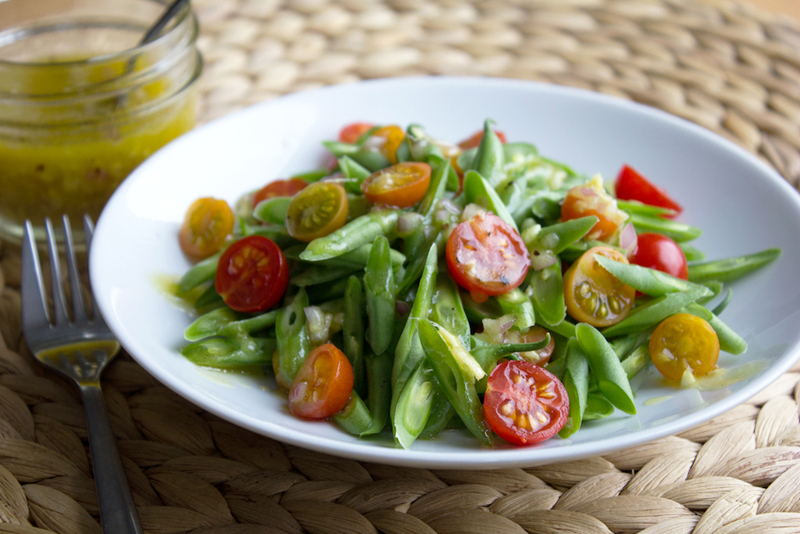 Sliced in half with a pile of chopped fresh green beans, and drizzled with gingery shallot vinaigrette — this is how I’m saying so long to my favorite summer snack. 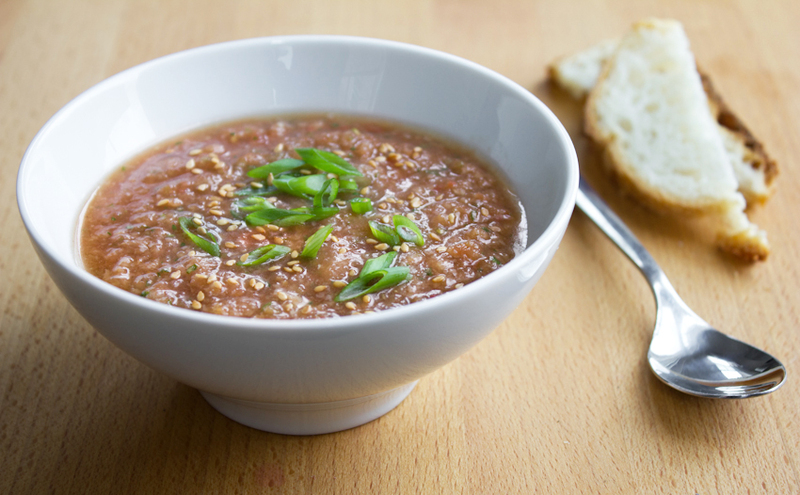 This Asian-style gazpacho takes a lot of cues from the traditional chilled soup, and I really loved the depth that toasting the bread and sesame seeds added to the flavor. With that in mind, I served this soup with sourdough bread toasts. 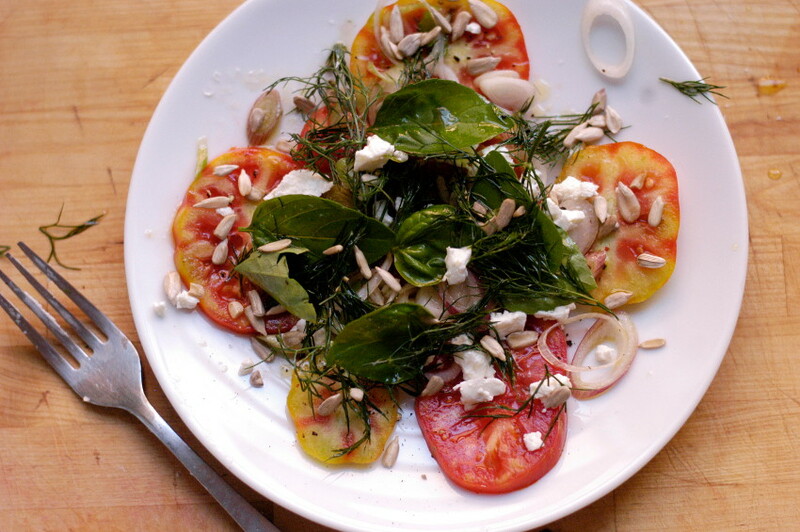 It’s a simple salad, but with so many fresh tomatoes and herbs around, why do more? Seek out the best heirlooms at your farmer’s market. 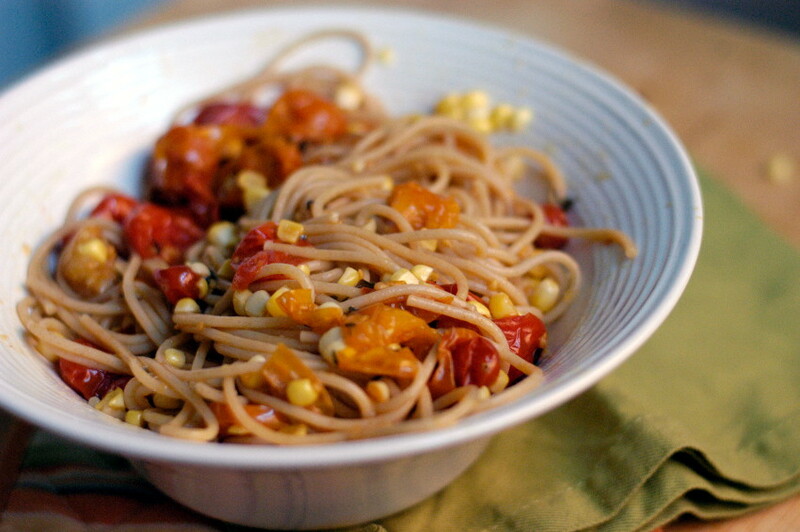 The tomatoes are truly the key ingredient here (and go for color, too!). Bill and I had one of those great, lazy Sundays where we just wandered around a few Chicago neighborhoods until we were ready to eat dinner. He decided on this recipe and we had a little kitchen/grill collaboration on a gorgeous late afternoon — complete with some hoppy brews from Ohio left by a friend. Please forgive me for sharing what may be the simplest, most generic summer meal. I can’t get enough of heirloom tomatoes! Chop the tomatoes and place them in a large bowl, along with their juices. Drizzle the olive oil over top, and season well with salt and pepper. Let the tomatoes rest. Mince the shallots and garlic. In a small saucepan, heat a couple splashes of olive oil over medium heat. Add the shallots, season with salt and pepper, and cook until softened, about 5-7 minutes. Next, add the garlic and cook until fragrant, about 1 minute. 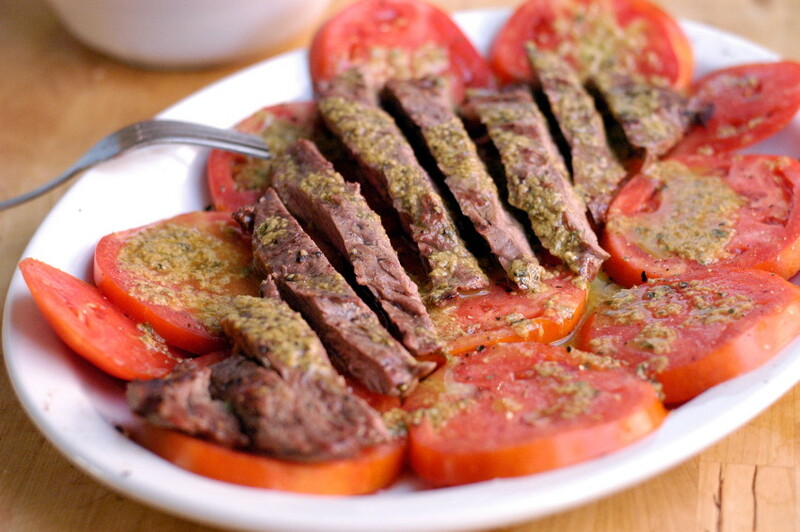 Remove from the heat, and add to the bowl with the tomatoes. Tear the basil leaves, and add them to the bowl. Stir to combine, and let rest while preparing the pasta. Cook the pasta according to package directions, and drain. 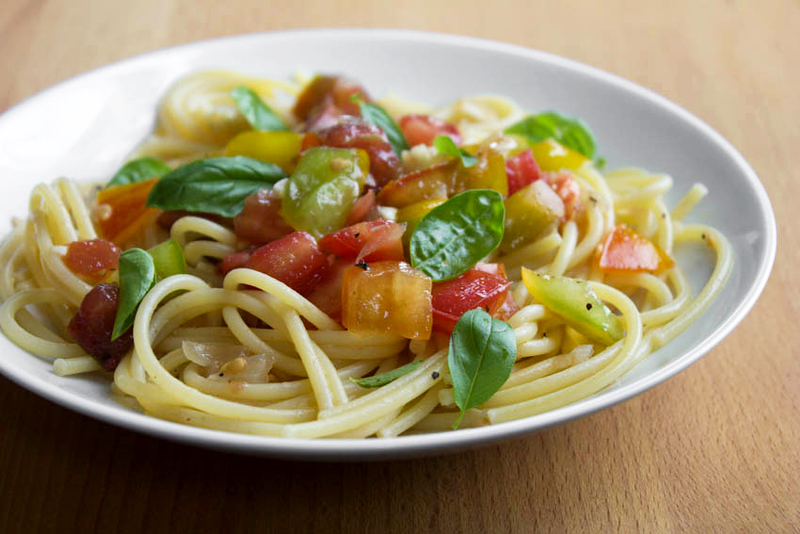 Add the pasta to the bowl with the tomatoes, and toss well to coat with the sauce. Divide among 4 bowls, and serve warm.